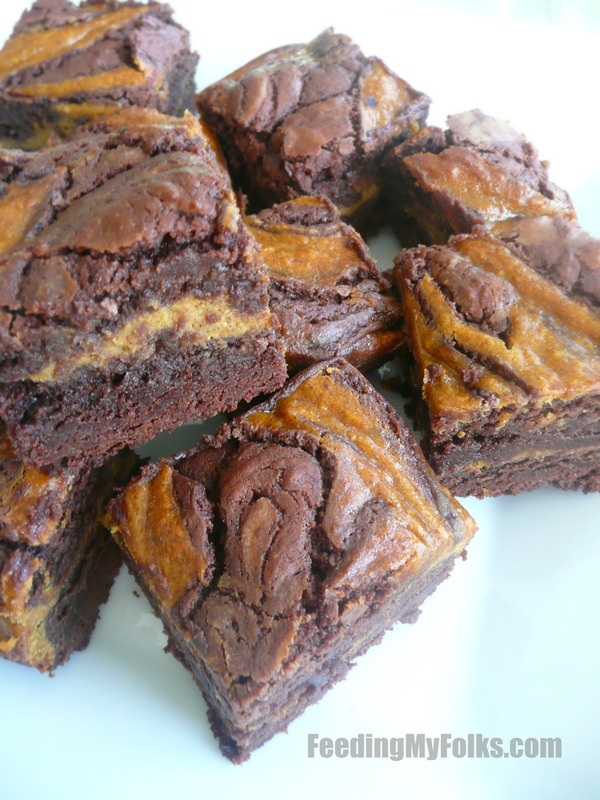 These pumpkin swirl brownies began when I found a “brownie” recipe from Martha Stewart online and hated it. I don’t usually like to bash people, but her recipe was NOT a brownie! Oh Martha, have you gone mad? Don’t you know that a brownie is supposed to be chocolaty?! Her’s was more like a mediocre flavored cookie bar. Sigh. Anyway, I knew I could do better so I changed all of the measurements, added in some different flavors, and whipped up a batch of true brownies with a delicate pumpkin swirl rippling through them. Delicious! I’m really proud of this recipe! Yesterday I made some of these treats to serve as one of our many Thanksgiving day desserts. They were a hit! 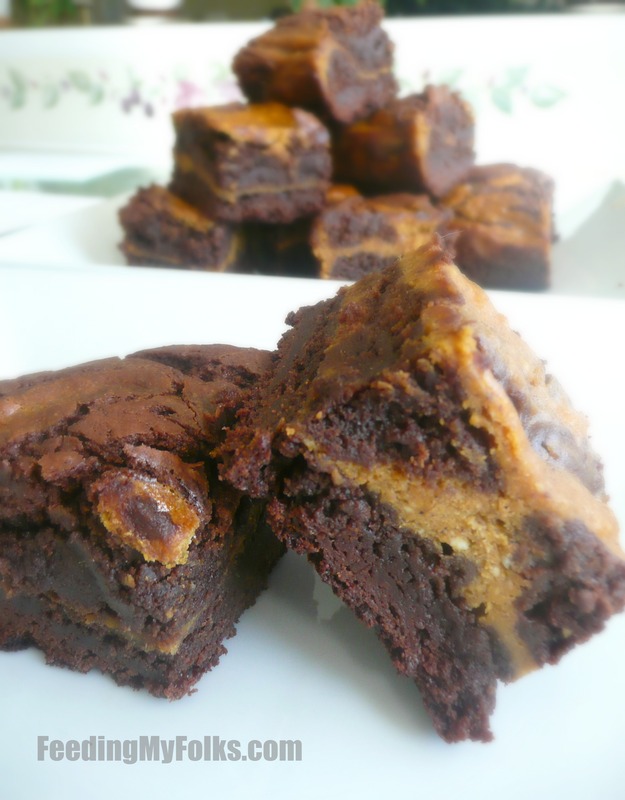 Everyone loved the chewy chocolate brownie speckled with festive pumpkin spices. It’s as if a block of fudge and a moist cake got married and had a baby. 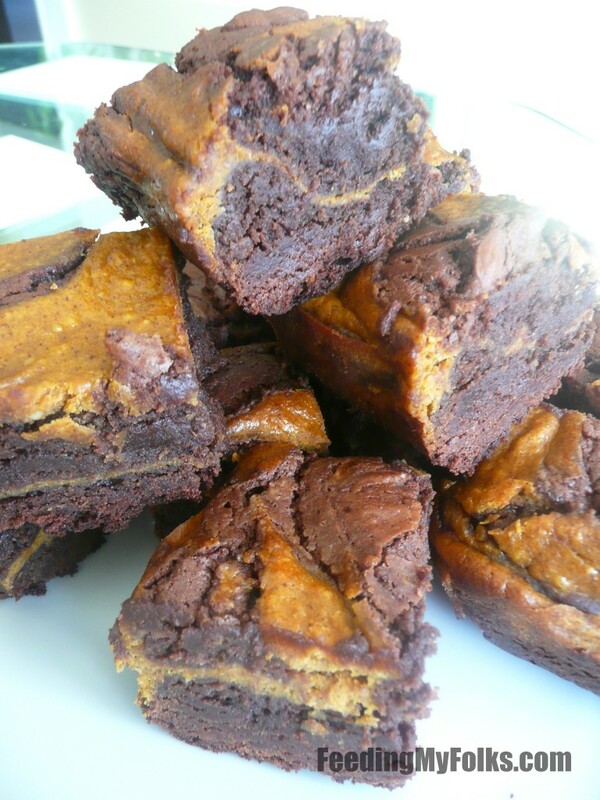 I know it sounds weird, but these brownies are like fudgy cake! The pumpkin swirl is more like a river of fresh pumpkin pie that’s just enough to give you a taste of fall. It pairs beautifully with the chocolate. If you want an entertaining tip, here you go — to impress your guests, bake something with a drizzle or a swirl. Swirls make everything look gourmet and fancy. Last night we found out that my uncle isn’t even a brownie eater (I know…how can you NOT like brownies?! ), yet he still had two. Success! Don’t tell anyone, but my mom and I snuck some off the platter to save for later. We’re sneaky and selfish when it comes to great food. Don’t pretend you wouldn’t do the same! In another bowl, sift together the flour, baking powder, salt, and cayenne pepper. Add to the sugar/egg mixture. Stir to combine. Over a double boiler on low heat, melt the chocolate and butter until smooth. Slowly add to the flour mixture. It will be thick. 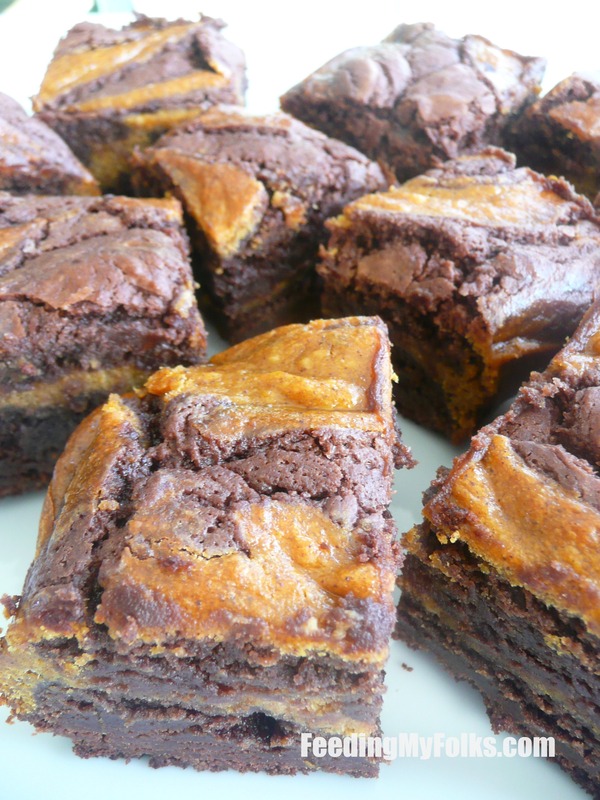 While the chocolate melts, whisk together the pumpkin, sugar, egg, cream cheese, cinnamon, and nutmeg. This will be your pumpkin swirl. Put into the oven and bake for around 60 minutes, or until it sets.